​Adelaide Louisa Hall was a jazz singer and actress born on 20 October 1901 in Brooklyn, New York. She was the daughter of Elizabeth Gerrard, an African American woman and William Hall, a man of Pennsylvanian-German descent. When she was young, Adelaide and her sister, Evelyn, attended the Pratt Institute in New York City, where her father was a music teacher. The sisters formed a piano and singing duo which performed at small events, such as at church or school fairs, until Evelyn unfortunately died during the influenza epidemic, by which point their father had also died. 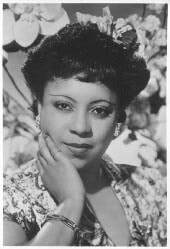 ​She made her debut in 1921 as part of the chorus in the pioneering African American Broadway musical ‘Shuffle Along’. In 1926 she toured parts of Europe, including Austria, Scandinavia, Berlin and the Soviet Union, as a star in the musical Chocolate Kiddies. In 1927 she met the famous jazz musician Duke Ellington, who immediately recognised her talents. She went on to record several songs with Ellington and his orchestra, their most famous being Creole Love Call. Adelaide became one of the early pioneers of Jazz featuring at the famous Cotton Club. She rose to further fame when, after the death of Florence Mills, she joined the musical Blackbirds of 1928 (the Blackbirds theatre troupe of 1937 visited Hull- click here to read about them). Between 1926 and 1936, Adelaide married Bert Hicks, a merchant seaman from Trinidad. In the early 1930s, the couple were forced to migrate to Paris after moving to an all-white neighbourhood in Larchmont, Westchester County, New York and suffering racist abuse. They stayed in Paris for three years where Adelaide starred in Moulin Rouge and Lido before moving to England and becoming a British national. In the 1930s Adelaide featured in several theatre productions, including Brown Buddies on Broadway, toured as a solo artist and featured in films such as All Coloured Vaudeville Show. In 1938, she featured in The Sun Never Sets in London and established her own radio programme. She continued to record songs into the 1970s which featured on local radio stations including Hull and East Yorkshire. During the Second World War, Adelaide travelled to battle zones to entertain the troops. After the global conflict had ended, she toured Britain arriving in Hull in the spring of 1948. In April, the Hull Daily Mail advertised that the jazz singer who had ‘brightened many a West End show’ was to perform at the Tivoli theatre. She brought with her an exciting bill of talented entertainers which delighted spectators. They included the Lamonte and Julie Trio, Len Clifford and Freda known as “the bright spark and his flame,” comedian Jack E. Raymond, acrobats Keefe Brothers and Annette, the ventriloquist Tattersall, and dancers Jimmy Kidd and June. Although, contemporary commentaries on this event are sparse, it is probable that local audiences enjoyed a fantastic evening of entertainments. After the tour, she returned to her home in the capital. ​Although, Adelaide lived in London, she returned to the United States many times to perform both as a solo act and on Broadway. In 1957, she starred in the theatre production Jamaica alongside the famous entertainer Lena Horne. She stopped performing for a length of time while her husband was ill, but she returned to the spotlight a few years after his death in 1963. During her career, Adelaide recorded the soundtrack to several films, made guest appearances on many TV shows and provided her distinctive singing voice for some characters in films, such as a character in the British film The Thief of Bagdad (1940). Towards the end of her life, in 1989 a documentary was made about her life called Sophisticated Lady. A few years later she performed for the last time, singing over two nights at Carnegie Hall, New York. After a short illness, Adelaide died on 7 November 1993, aged 92. Overall, her career spanned seventy years, from the 1920s to the 1990s.